It’s been a long wait, made all the worse by 360 gamers having these DLC downloads months before the PS3, but the expansion packages for Fallout 3 have finally started to arrive. The first of which is Broken Steel. It’s more of a taster and a foundation for the new adventures of Fallout’s post-apocalyptic hell (that we love so much). The new chapter starts two weeks after the final events of the original game. No spoilers here for those of you who aren’t there yet, but you WILL have to finish the main game before the extra missions and plot are made available to you. So I hope you’ve kept a save near the end of the game. On the plus side, if you haven’t finished the original yet, you don’t have to wait for Broken Steel’s main benefit; your Experience Points level cap will be upgraded to 30 regardless. However, if like many impatient players you’ve pretty much done everything the main game has to offer and collected the Platinum Trophy, you’ll already have maxed out at level 20 and are probably worrying about being able to find enough extra EXP. You don’t get any retro-active EXP and after finishing the Broken Steel missions you might only have reached 24 so hopefully future DLC episodes will let you carry on from here to reach level 30. Each time you level up you can choose an old unused perk or one from a progressive list of new ones that don’t disappoint. If it’s been a while since you visited the Capital Wastelands the familiarity and compulsive weapon hording soon kicks in, albeit after you’ve finally remembered there isn’t a sprint button and you stop pressing Select to open your map screen (been playing other shooters have we?). So what of the missions themselves? They all take you to new areas, just off the old map and you get to them via sewers and tunnels. These entrances feel like they were always in the game rather than crudely implemented, obviously new bits. The one grievance here is the amount of tedious metro tunnels, sewers and maintenance corridors that you have to plod through to get to the new areas. 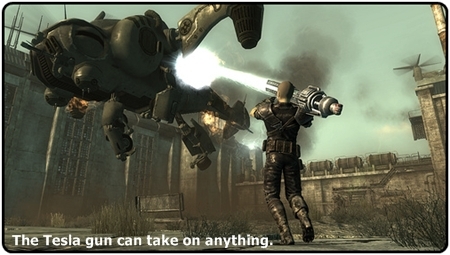 It was a ball-ache in the main game and one of Fallout 3’s few downsides. The objectives are based around trying to wipe out the Enclave as a new member of the Brotherhood of Steel, starting off with an assault on one of the Enclave bases with the assistance of the Brotherhood and Optimus… sorry, Liberty Prime. The other missions involve stealing a new weapon, the Tesla Coil (you’ll like this one) and heading off to a huge airfield base occupied by the Enclave. 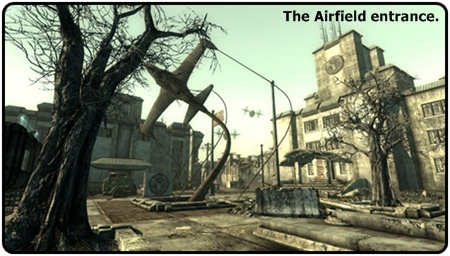 The airfield mission is the most difficult seen in Fallout 3 yet with relentless tides of Enclave troops, many of them wielding new weapons and sporting new armour. Naturally you can rob their corpses of these. Enemies in Broken Steel all seem to be tougher than before so load up on Stimpacks and have some spare armour to help with repairs. You can earn extra caps later on by hunting mutants in DC or collecting lots of two specific items, which I won’t tell you what they are, but you will grind your teeth as you’ll definitely have passed them on your travels. Sod it, one of them is cameras. There are about six hours play from the three missions here if you’re the type of Fallout player to take your time and scavenge every nook and cranny to find ammo and more sets of armour than you’re ever going to need (so much Tesla armour!). Trophy fiends can expect one for each mission plus familiar levelling up ones. The DLC pack itself is given a separate Game Data file (746MB) so you don’t have to worry about losing it if you want to delete the hefty install file of the main game at a later date. As mentioned earlier, this is more of a foundation for the future DLC episodes which are getting quick, successive releases soon. While a bit short of missions it is enjoyable once you get out of the tunnels and the new perks, higher level cap and new weapons will whet your appetite for the feast of new episodes that are about to make their long overdue appearances on the PS3. However, if all five of these packs are going to be £7.99 you might want to hold on and buy the upcoming Game of the Year Edition of Fallout 3 for as little as £30 as it has the full game and all the DLC. Plus your original edition save file will probably be compatible and you can save some cash. Can you wait that little bit longer though? 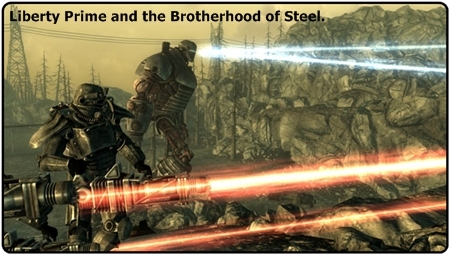 You can read a review of Fallout 3: Operation: Anchorage here.